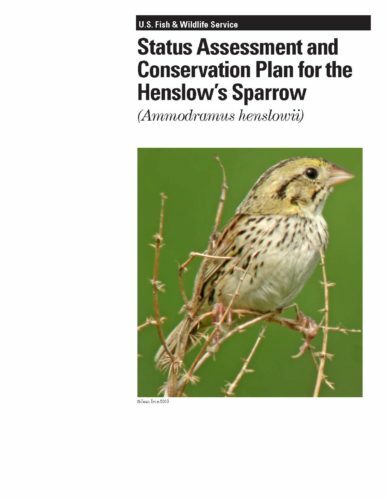 A status assessment and conservation plan for Henslow’s Sparrow. Concern over population declines resulted in this species receiving special conservation status throughout its range at both the state and national level, including designation as a Focal Species for the U.S. Fish and Wildlife Service. Recommendation reflect stakeholder input gathered during a Henslow’s Sparrow Conservation Plan Workshop held in March 2007. This input included developing population goals and identifying conservation priorities for both the breeding and wintering range of the species. It also included conservation actions containing research, education, and management components.